The non-radioactive Tag-lite® solution is quickly becoming the industry standard for studying receptor-ligand binding interactions. Cisbio scientists have validated 43 Tag-lite binding assays as of this writing. If the receptor you wish to study is not listed, remember that Cisbio’s team of experienced experts works hand-in-hand with clients to create custom binding solutions. All ligand binding assays listed here include labeled cells and their matching fluorescent ligands. Two basic binding protocols – saturation binding and competitive binding – are used to assess equilibrium dissociation constants for the labeled probe (Kd) and the unlabeled compounds (Ki). To determine Kd, the fluorescent ligand is titrated into a solution containing a fixed amount of labeled cells, and then incubated to equilibrium. The video below provides an overview of the protocol. To determine Ki, the compound is titrated into a solution containing a fixed concentration of fluorescent ligand and a fixed quantity of cells. At equilibrium, the fraction of labeled ligand bound to the receptor is proportional to the recorded FRET signal. Binding affinities are calculated from this resulting signal. The video below provides an overview of the protocol. Growing evidence suggests that ligand–receptor binding kinetics is an overlooked factor in drug discovery. Cisbio has developed Tag-lite® kits and services to address the kinetic binding needs of GPCR researchers around the world. Binding kinetics relates to the rate of association and dissociation of a drug-protein complex. Binding kinetics is thought to be a critical parameter for optimizing the in vivo efficacy of drug candidates. As such, kinetics is receiving increasing attention in drug discovery efforts. Tag-lite combines the flexibility of a radioligand binding with the advantages of homogeneous nonradioactive technologies such as SPR. The homogeneous character of Tag-lite enables binding events to be monitored continually without ever having to stop the reaction. Motulsky and Mahan described equations that could be used for studying the kinetics of competitive binding. Fitting of data using Tag-lite to these equations allows the determination of the association and dissociation rate constants of the unlabeled competing ligand. 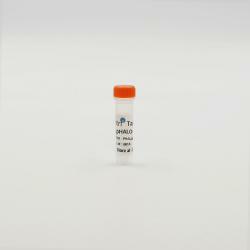 Tag-lite offers freedom and flexibility to build up your assays from target construction to assay development. A plasmid construction is engineered with Tag-lite plasmids and the gene encoding your protein of interest. 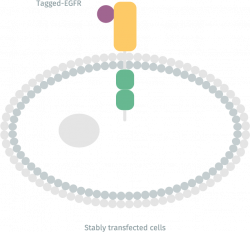 Once transfected into cells, these plasmids lead to the expression of a protein fused with the tag. 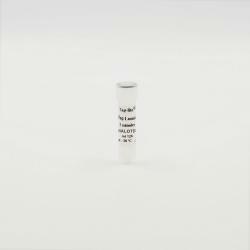 The tagged protein covalently and specifically interacts with Tag-lite substrates. Cisbio has optimized a plasmid encoding SNAP bordered by restriction sites, for cloning a gene of interest. By using this plasmid, a construction can be engineered. This construction encodes for the protein of interest and SNAP-Tag in the N or C terminal position. A selection of substrates labeled with HTRF fluorophores is also proposed for SNAP-tag. 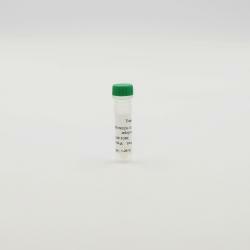 Choose an empty plasmid among the 3 different selection markers: Hygromycin, Neomycin, Zeocin. Using standard cloning techniques, insert the GPCR gene of interest into the empty plasmid. 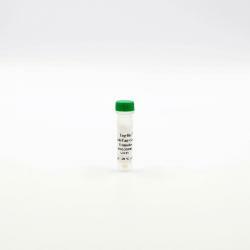 Using standard transfection techniques, transiently express the TAG-GPCR of interest in your cell line. Perform the binding assay you designed and built! Distinguished researchers around the world have already switched from radioligand binding to Tag-lite to handle their kinetic binding needs. One such researcher is Stephen Charlton. Watch this free webinar to hear Stephen discuss the importance of ligand binding in drug discovery. If, like Stephen Charlton, you are ready to use Tag-lite for all your kinetic needs, this application note is your next step. It describes how binding kinetics studies can be enriched with a Kon, Koff approach by providing critical data on how the association and dissociation rates of a receptor-ligand couple can be assessed with streamlined no-wash Tag-lite assays.